The most awe-inspiring, most extraordinarily capable Grand Cherokee ever conceived has just been unleashed. Take control. Equipped with Quadra-lift which allows you to command your altitude through full control of the suspension. Elevate your vehicle for a maximum, Best-in-Class+ ground clearance of 10.6 inches. Trailhawk™ also drops 1.5 inches to accommodate easier entry, exit, and loading. En route, Trailhawk's posture can be pitched forward to maintain headlight focus onto the road. 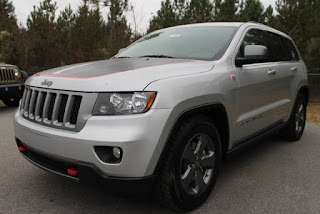 Trailhawk™ complements its overwhelming power with matching persistence. Robust and permanently on-guard, Trailhawk's front suspension and drivetrain plates were born to protect the underside from rocks and debris. Constructed of 3-mm thick stamped steel they include: a fuel tank skid plate, transfer case skid plate, front suspension skid plate and underbody skid plate. Solid steel rock rails are fitted to provide rocker panel and lower body-side protection throughout your most daring adventures. Just to be Trail Rated® means to have the freedom to Go Anywhere. Do Anything® – usually on the world's most demanding terrain. For Trailhawk™, even this renowned Jeep® standard of demonstrated off-road capability is just an appetizer. Beginning as a dream of what might be, the full performance envelope of this extraordinary vehicle has yet to comprehended.